Just a quick catch-up on my progress on my ADL journal. 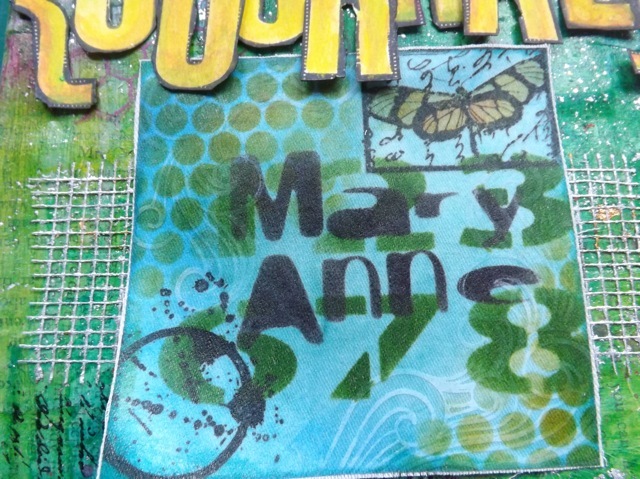 The cover was looking a little bare so I’m planning to add the letters I previewed recently as well as piece I made and never used, where I worked directly on t-shirt transfer material, using ink, stamps, and stencils. The original post where I made this piece is here. That’s as far as I’ve gotten on the challenges but as I am now into MAY for the weekly pages I anticipate moving to a daily entry very soon! I imagine I will work up to the 1st of June on the old stuff, then start at the mid-point of the year. That’ll serve as proof I actually HAVE made progress! 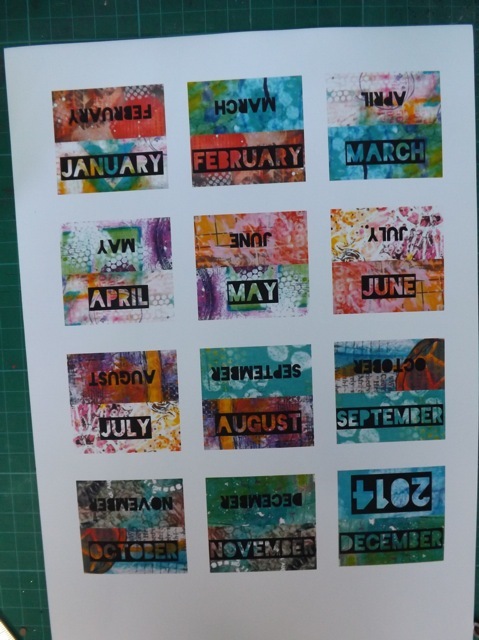 I’ve added the small calendar cards from my printables, same font as the day and date bits, so it all ties together. 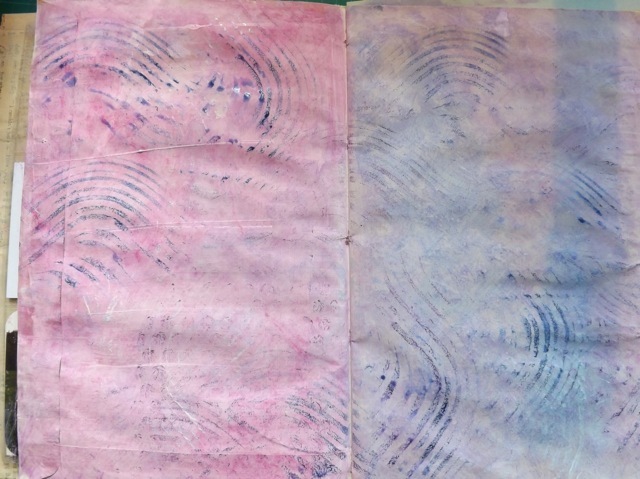 I’ve opted to keep the two page spreads in similar colours, not quite treating them as a continuous spread, but using the same stencil on technique on both. You can see from the shine that the photo sleeves are sewn in, one located within each month, and some of the pages are open at the side, where the base envelopes are open, to create pockets. Phew. I think I like making the book from scratch, but for it to function as a proper planner I would probably opt for printed or purchased planner pages in the smaller size. This book is a MONSTER, and doesn’t really fit even in my quite large purse/bag, so id destined to operate less like a planner and more like a journal/diary. Like most things, this is more about me deciding if I really want to embrace the process by trying it, so I don’t mind spending time on something I may not actually keep up with. I certainly feel like I’m gaining arty experience and that is always a welcome thing. 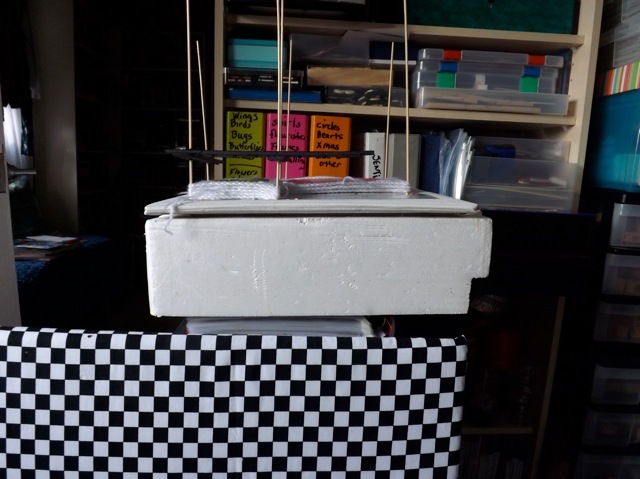 I’m looking forward to doing more of the weekly prompts to work out the best way to attach or insert the pieces from those, either the stick on flips that are central to the ADL planner design or inside the pockets, that are peculiar to my book. Categories: A Documented Life | Tags: A Documented Life | Permalink. I thought it was about time I caught you up on this. Progress is not as fast as I would like and I am slipping behind every day. My thought was the best way to drop in to this so late in the year was to make the bare bones of all the pages up to the current dat. It’s fun but time-consuming. I came up with a few shortcuts, mostly (surprise, surprise!) 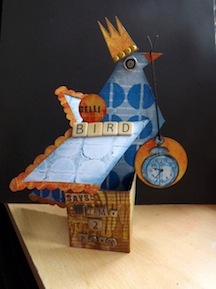 by creating digital bits to print. I would imagine that if I carry on doing it I would do more from scratch. My plan is to begin doing it and create a month of pages just before the first of the month, so I can just get into the habit of updating it daily. I already talked about my tabs. I joined the FB group (must be driven, cause you KNOW I think Facebook is evil and not much will drive me there) and saw this post by Carole. 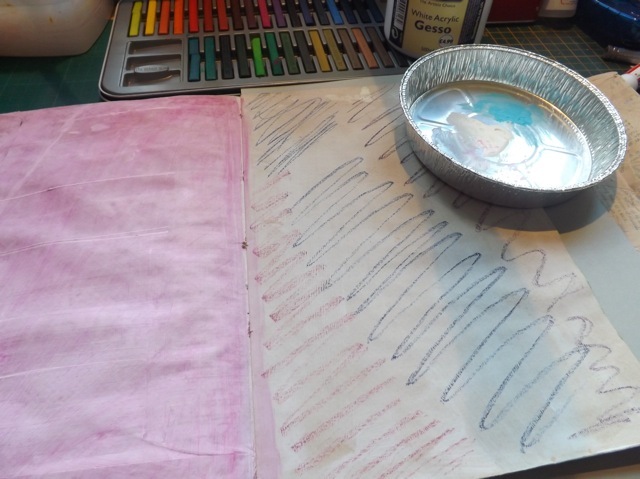 I loved the stripe-y border she used but couldn’t tell if it was cut from paper, stamped, doodled… My method of accomplishing it was to print out a sheet of stripes then slice it into thin strips. 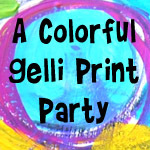 That way I can print as many as I like and don’t have to keep finding checkerboard or striped paper. Then I did a background or two – at this point, in the interest of speed, I am looking to get them done – I’m playing around with a few techniques and this one grew out of my concern that the Inktense blocks are…intense. To soften them I decided to scribble on the page, but when it came to blending them I used a damp baby wipe that had been dipped in a smidge of gesso. I liked the effect. Much softer colour and maybe you can see I really used very little of the blocks in the scribbling. 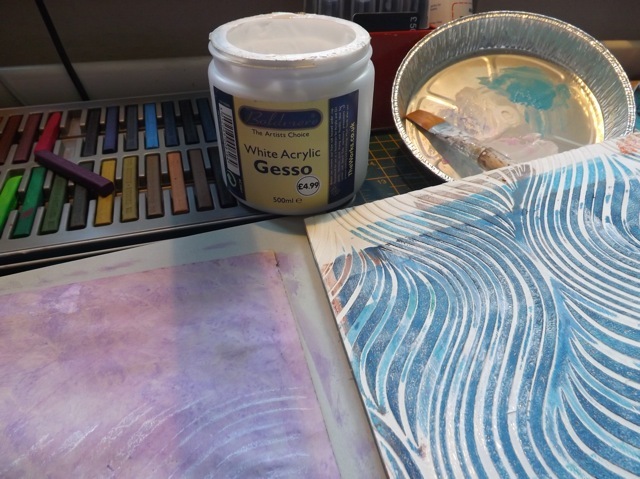 To get some pattern in there, but again, quite soft, I brushed some gesso onto one of the texture plates I made from the anaglypta wallpaper for using on the Gelli plate. That gave me a nice enough print (although it probably doesn’t show up in the photo as well as it does IRL. You can see that texture pad is caked with acrylic paint, but it didn’t transfer when printing with it. 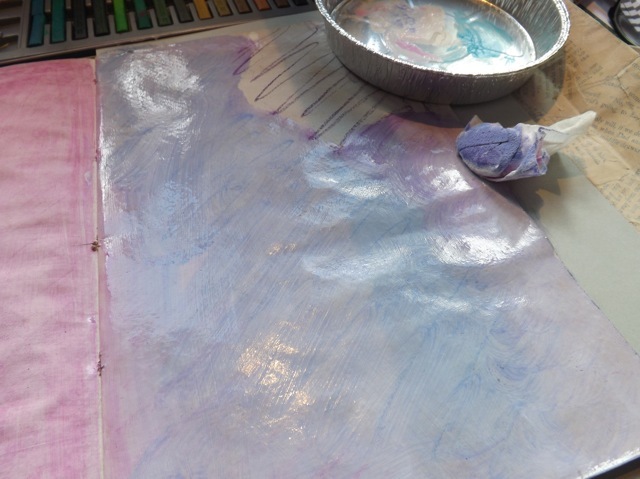 So then I decided to try rubbing the side of the Inktense block onto it and misting it with water to activate the ink. That gave me a much darker impression. Def. 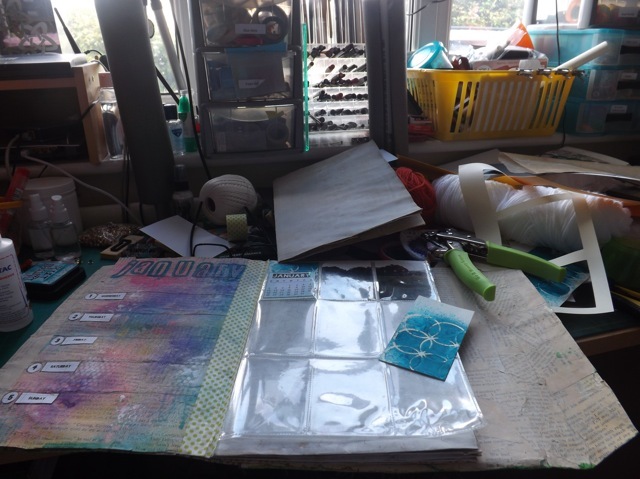 will do THAT again – I have A LOT of these texture pads that I’ve made and lots more (a near endless supply) of options cause I can tear off a “sample” at all of the wallpaper departments of about 5 or 6 different stores i my area. 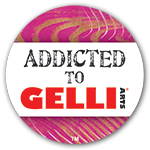 I only need a few inches, although these are more like A4 size cause I wanted them for the bigger Gelli plate. 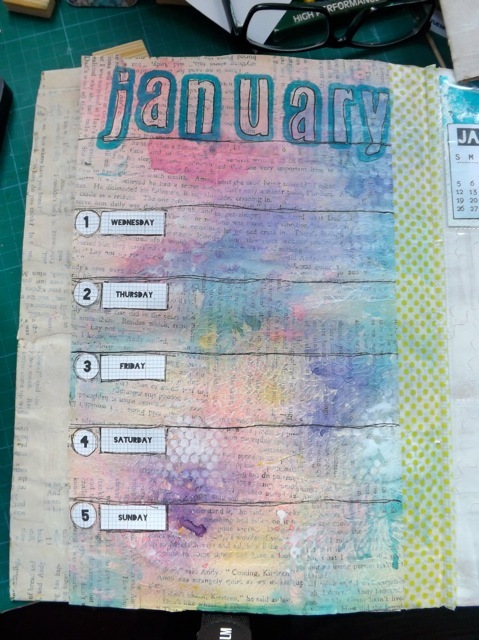 I carried on adding the little date and day printouts (cut ‘n paste) and did one page using thin Washi Tape for the divides. So far so good. If I can do a month a day (unlikely) I’ll probably be ready to start properly in a week. 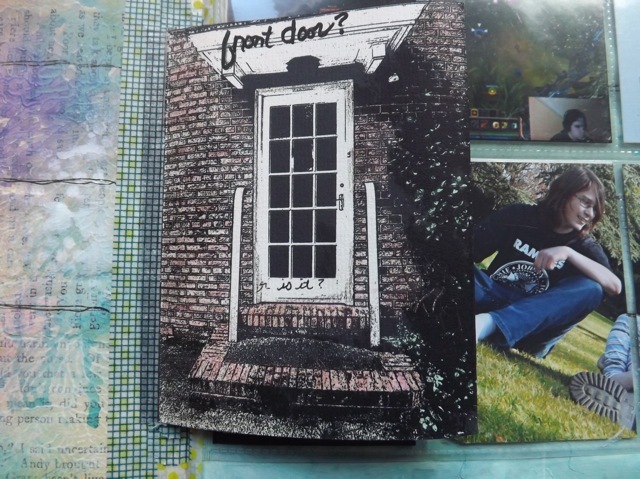 I did do the January prompt (front door) but as this is already long I’ll add that tomorrow, along with a better look at the elements that make my book different. 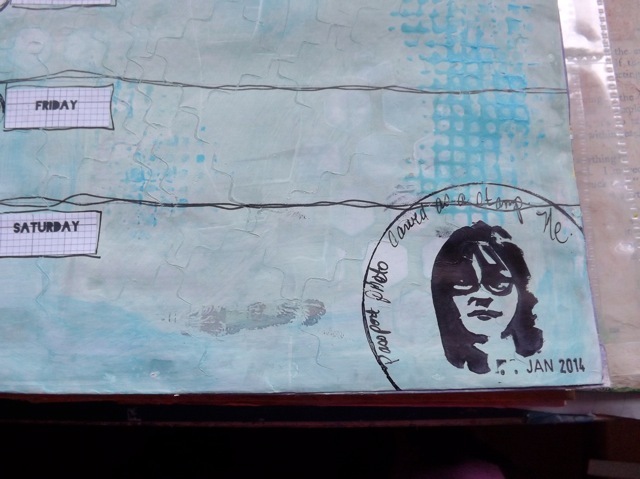 Categories: A Documented Life | Tags: art journal, art techniques | Permalink. This tight shot really doesn’t show the horror of it all. But there you can see the journal I am converting into something I can use for A Documented Life. I know a few people from WOYWW are doing it. Mine is, as you probably would have guessed, NOT the standard Moleskin planner. I will have to do a post .. erm.. DOCUMENTING it. It will end up being a sort of hybrid creation. It will have pages for the daily journaling, sewn in Baseball card holders to incorporate small ATC sized photos (and even PL cards if I want) and some of the pages, as I’ve previously mentioned, have pockets, as they are folded over large format envelopes. Here is a not very good shot of the January Week One page. 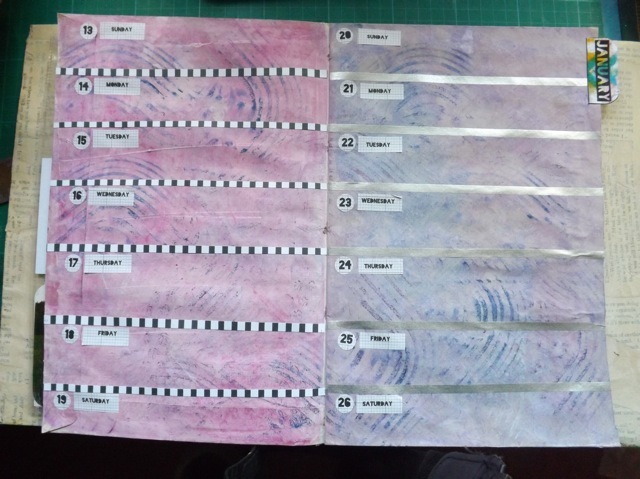 On the left is a set of monthly tabs that I made by digitally “cutting” a bit of my previously done art journal pages then adding the months over them. 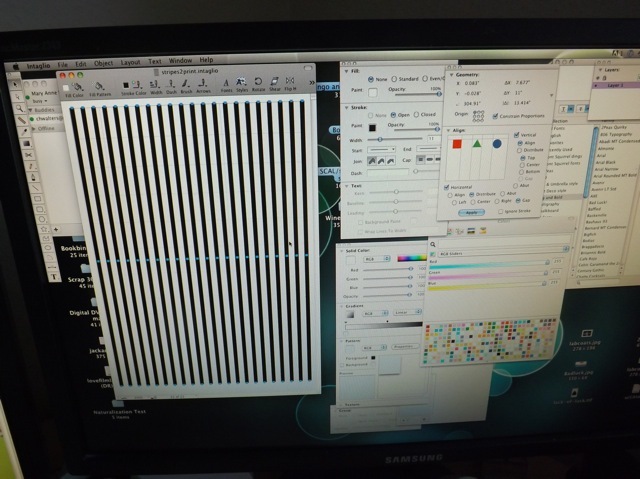 Each tab has a month on one side, then when folded, show the NEXT mont on the other side. 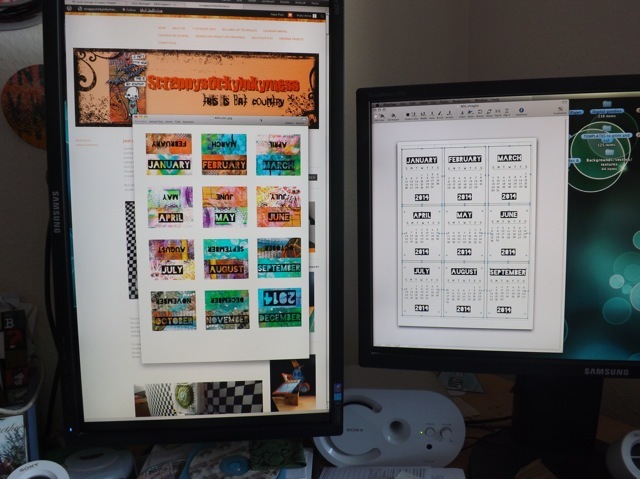 On the right is one of my calendar printables, resized to fit the pockets. I’m really happy with how they came out!You may recognize some of the bits. I did, in fact, make the granny-square storage-stretcher that I mentioned I had the idea for yesterday. 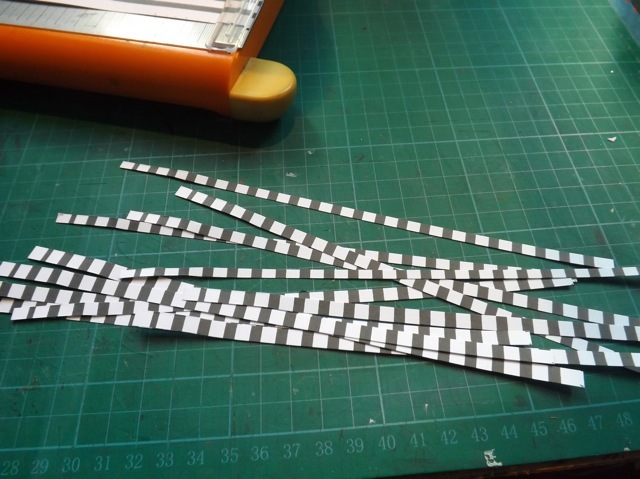 I think you can just about see that the design is pretty much as I mused – skewers and a stack of blocked squares stored on them – there are a few bits and pieces to explain. Categories: A Documented Life, WOYWW | Tags: WOYWW | Permalink.